Emerging technologies in classrooms help students build their skills and knowledge. Emerging technologies are adding a twist to the nature of education in elementary schools. The latest advancements have increased access to information and helped make classrooms more productive, collaborative and engaging. Emerging technologies have changed the roles of teachers and textbooks so they’re no longer the only sources of information in a classroom; they serve as guides that facilitate learning. It’s becoming more common for teachers and schools to use blogs to communicate with parents, students, peers and the community. A teacher may use a blog to share a classroom’s activities or to continue conversations outside of school. A blog can also serve as a platform to post calendars, permission slips, handouts and other materials that parents can view, print or download. With the use of RSS feeds, parents can stay up-to-date on a child’s homework assignment and project due dates. When blog posts are able to include different forms of media such as audio files or videos, students can review the media at home to practice skills learned in the classroom, such as reading. Streaming videos can give elementary classrooms access to events happening around the world in real time. A teacher can complement a classroom’s studies about outer space, for example, by pairing the lessons with live video feeds from NASA astronauts in space who talk about their experiences and the different mathematical and scientific applications they use. According to the Cisco Systems Inc. publication “The Impact of Broadcast and Streaming Video in Education,” streaming videos can help students have a better understanding of complex ideas. Video capabilities also allow children to chat with students in a sister school or take a virtual field trip without leaving the classroom. Handheld tablets offer schools the ability to purchase physical textbooks and other printed materials in electronic form. They also give students the ability to instantly access built-in dictionaries, student-created journals, calculators, stopwatches and electronic books without the bulk of books and other supplies. Read-along capabilities offered in tablets benefit children learning to read or those learning a second language. 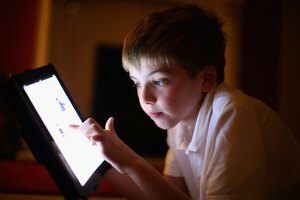 According to the Education Commission of the States, 52 percent of children 8 and younger had access to a touch-screen device in 2012, showing that this type of interactive technology is a familiar type of media. Tablets also offer the opportunities for mobile learning and encourage sharing and collaboration. Gaming is a prevalent form of recreation among children. When a teacher incorporates video games into the classroom, they give lessons a sense of context and relevance that the students may not find in a textbook. Games offer emotional engagement and social interaction in a way that helps students learn. Some of the best classroom video games are those that require the collaboration of peers and problem-solving situations with real-world applications. When teachers offer information in a gaming-like platform, students may feel more motivated to learn. 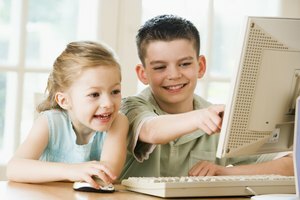 Should Elementary Students Use Computers in the Classroom? Richards-Gustafson, Flora. "Emerging Technology Used in Elementary Schools." 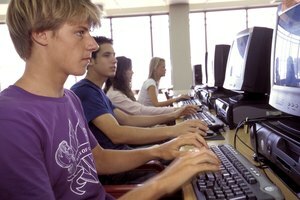 Synonym, https://classroom.synonym.com/emerging-technology-used-elementary-schools-11251.html. 26 September 2017.